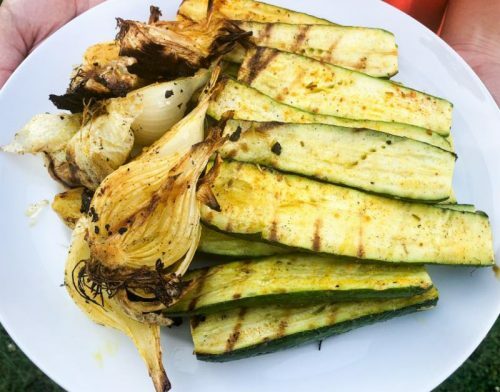 Grilled garden zucchini and squash are a known summer treat. But, have you ever tasted a grilled onion that was just harvested? If not, this is a sweet, juicy summer treat you should track down. Mix olive oil and seasoned salt blend together. Brush over all sides of the onions and zucchini. Place onions skin side down (on their round sides) on a hot grill. Grill for 6 to 8 minutes until they appear to be cooked halfway though. Brush the slices with more of the olive oil mixture and and flip over so the flat side is face down on the grill. Add zucchini halves to the grill. Cook for 3 minutes. Then flip zucchini halves and brush with the seasoned olive oil. Cook another 3 minutes. Onions and zucchini should be tender and juicy. Plate, serve, and enjoy this summer treat.